Several Egyptian terrorists killed in an air strike in the Sinai allegedly carried out by Israel. Several Egyptian terrorists were killed in an air strike in Sinai on Friday, which some claimed Israel had carried out. Security sources and witnesses said the terrorists were struck as they prepared to launch a rocket into Israel, reported AFP. The source of the strike was not immediately clear. Some sources spoke of an Israeli air strike conducted from Israeli air space and others credited the Egyptian military. Witnesses said at least five members of a cell led by local Islamist militants were killed in the raid. Egypt's army said two explosions were heard at around 4:15 p.m. local time in the Al-Ojra area, around 1.8 miles from the border with Israel. "The armed forces are combing the area of the explosions to find out the cause," army spokesman Colonel Ahmed Aly said in a statement quoted by AFP. The IDF would not comment on the alleged airstrike, saying it “does not comment on reports in foreign media outlets,” reported Channel 2 News. If Israel indeed carried out the airstrike, it would be the first time since the peace treaty with Egypt was signed in 1979 that Israel has attacked in the Sinai. 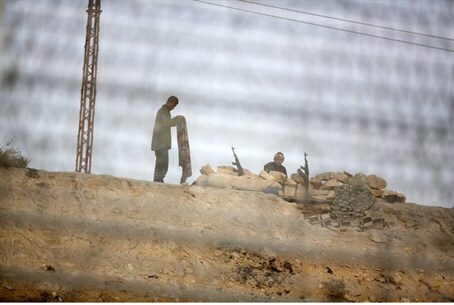 Some reports said that the Israeli airstrike was coordinated with the Egyptian military. Israel's military on Thursday ordered the cancellation of all flights in and out of the Red Sea resort of Eilat, which borders Egypt, due to what is said was a security threat. Last month, Israel deployed a battery of its Iron Dome missile defense system near Eilat, which has been a target of attacks in the past. Egypt's army is currently engaged in an offensive in Sinai to curtail a surge in violence since Islamist president Mohammed Morsi was ousted on July 3.